A Simple Menu Call Flow will route your calls to a specific department or person within your, or your clients’, organization. WhatConverts records and reports on the menu options selected. 3Select “Simple Menu” to set up a Simple Menu with editable options to route your calls to different destination numbers. Edit the Menu step by clicking the “Edit” icon in the top left of the module. Enter the Prompt (or append your recording) you would like played to the caller that tells them what to press (or say) to reach their desired destination within your organization. Choose your Response Type to determine if you would like callers to be able to press a key, say a trigger word or both to identify their selection. Finally, enter the values you would like the caller to be able to use; by default, the values are set as “1” and “2“. Choose your Timeout (the number of seconds the menu will wait before playing again or moving onto the next step), a message if there is no response and how many times to repeat this menu. Click “Update“. Edit your Dial steps. Click the “Edit” icon in the top left of the Dial module. Give your module a Name that identifies the step, Select your Dial Type by choosing “Direct Call“, “Multi-Ring” (to call multiple phone numbers at the same time) or “Round Robin” (to call numbers in a sequence). Enter the “Destination Number” of your step. Choose your Timeout (the number of seconds the Dial step will ring before moving onto the next step), which Caller ID that the recipient will be shown, a Call Whisper option and if you have a Post Call Flow. Click “Update” and repeat for all the dial steps for your menu. Edit the “Voicemail” step for unanswered calls. Select the “Edit” icon in the top left of the module. Give your module a Name that identifies the step, choose whether you would like the prompt to “Say Message” or “Play Recording“. Choose if you would like for your voicemail to play a Beep and select the maximum length of the voicemail message. Click “Update“. 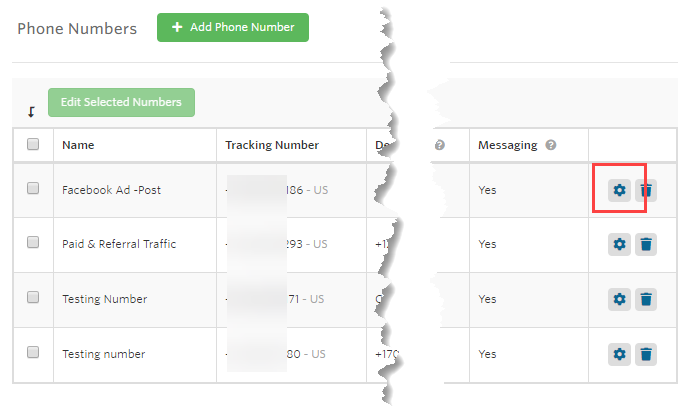 5Apply your Call Flow to your tracking number by looking under your Profile, select “Tracking“, “Phone Calls” and “Phone Numbers“. Click the “Gear Icon” at the end of the row to edit your tracking number(s).